Many people who have taken at least a passing interest in the global revolts of the 1960s will have come across a photo that evocatively encapsulates a sense of time and place. Paris, 13 May 1968. At least half a million people march across Paris to protest against police brutality. 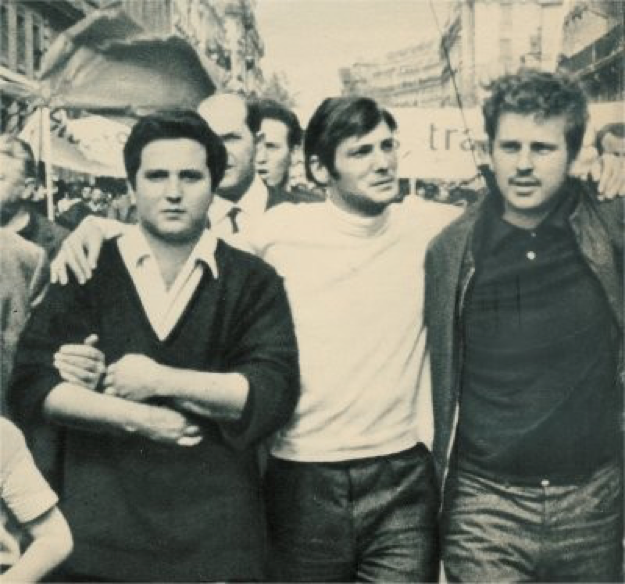 At the front of the cortege: Alain Geismar, Jacques Sauvageot and Dany Cohn-Bendit – the trio of spokesmen for the French student revolt. Sauvageot has one arm draped around Geismar, the other around Cohn-Bendit. The image exudes the male-bonding aspect of the student ‘68, and it is an image made in large part by Sauvageot’s very Sixties French style and good looks: the white poloneck, the shock of hair, the earnest gaze into the future. This, perhaps, was what Tony Judt had in mind when he wrote that ‘Its leaders were marvellously telegenic; attractive and articulate young men leading the youth of France through the historical boulevards of Left Bank Paris.’ It is the kind of thing that modern-day UK feminist critics of Corbynism might call ‘brocialism’. Yet today my experience of viewing that photo is jarring, because for reasons that will become clear, my abiding image of Sauvageot is not that portrait of youth forever captured for posterity, but rather that of a genial, bald, chain-smoking man whose expressive eyes would underline each of his points with a shrug and a brief moment of silence that spoke a thousand words. As we shall see, Sauvageot was a serious thinker and a serious activist who was in it for the long haul, defying the stereotype of the soixante-huitard as pseudo-revolutionary poseur. Another familar point in the chronology of May is the rally of the non-Communist Left in Paris’ Charléty stadium on 27 May. It is well known that the PSU played the major role in organising Charléty. For example, ‘Un chef d’orchestre? Le PSU en mai-juin 1968’, Xavier Vigna’s contribution to Le PSU: histoire et posterité, the 2013 book of a 2010 Sciences Po conference, although somewhat playing down the PSU’s role overall, acknowledges that Charléty was ‘coorganisé par l’UNEF, le PSU, la FEN et le Snes-sup’ without naming individuals. But it was not until after Sauvageot’s death last month, on reading his obituaries in Le Monde, that I realised that Sauvageot personally organised Charléty, for as his PSU comrade and UNEF’s lawyer Henri Leclerc recalled: ‘c’est lui encore la cheville ouvrière du grand meeting au stade Charléty, à Paris. Moins flamboyant, moins hors norme que Cohn-Bendit, il était essentiel dans le trio formé avec Geismar. Quand l’Histoire nous mordait la nuque, lui gardait la tête froide. J’ai le souvenir d’un garçon réfléchi dans une période ou tout le monde perdait la tête.’ So this was the missing piece of the jigsaw. Even if other sources suggest the idea for Charléty came from the PSU’s best-known figure and leader, future prime minister Michel Rocard, while Sauvageot himself was initially critical of the idea, it is characteristic that it was Sauvageot who ended up with the hard work of implementing Charléty. Yet Sauvageot was no ‘moderate’ sell-out or careerist. In debates within the PSU he opposed Rocard’s advocacy of a government led by former prime minister Pierre Mendès-France, who was at the time a PSU member – Sauvageot had even less time for one led by François Mitterrand – at one point apparently marching behind an ‘Elections, piège à cons’ banner. Sauvageot would go on to be active in what was probably the PSU’s most leftwing current, the Gauche ouvrière et paysanne. Yet of ‘68’s Famous Three, it was Sauvageot who most vanished from the limelight in the years that followed. It was Cohn-Bendit who really became ‘Monsieur 68’ in the public imagination; though even the Maoist Geismar had his moment in the sun in 1970, leading a hunger strike as France’s most famous political prisoner. By contrast, although as late as UNEF’s Marseilles congress of December 1968 Sauvageot had successfully fought off – to cries of ‘Sauvageot gadget’ – a strong challenge from no less a talent than Daniel Bensaïd for control of the union, he then disappears from most narratives of the ‘68 years’. Sauvageot is entirely absent from Kristin Ross’ influential 2002 May ’68 and Its Afterlives – perhaps because he fell between two stools: not dominant enough a ‘memory baron’ to require taking down a peg or two in the style of Bernard Kouchner, yet too well known to be just another anonymous activist in need of rescue from historical oblivion. In Philippe Artières and Michelle Zancarini-Fournel’s monumental 2008 work 68: une histoire collective, Sauvageot does get 7 index references, but Geismar gets 14 and Cohn-Bendit 38. The same year, Sauvageot told Le Monde that since ’68 he had never actually seen Geismar and Cohn-Bendit again, emphatically distancing himself from the imagined community of the trio: ‘La photo où on nous voit tous les trois lever le poing était de circonstance, nous n’avions pas d’affinités particulières et nous n’avons pas de réunions d’anciens combattants’. He does not appear to have had an obituary in any major English-language newspaper: it is hard to imagine that being the case with Cohn-Bendit, and it was not the case when Bensaïd died in 2010. Even within the now multiplying historiography on Sauvageot’s own party, he is surprisingly marginal. Charles Hauss’s 1978 monograph The New Left in France notes that ‘PSU activists led the UNEF’ in May 1968 while not actually naming Sauvageot himself as the leader in question. Sauvageot’s total absence from 1994’s hefty Histoire du PSU by Marc Heurgon, a leading light of the PSU and the official party historian, is unsurprising given that this volume 1 of a planned 2 volume publication that Heurgon did not live to finish ends in 1962 when Sauvageot was only 19. But Heurgon – the son of a chateau owner and the Professor of Latin at the Sorbonne, and who according to the PSU activist Guy Phillippon was ‘l’éminence grise de l’UNEF’, ‘plus puissant que Daniel Cohn-Bendit’ – was a grander, more self-important figure than Sauvageot, whose grandparents were peasants, and was one of the student activists mentored by Heurgon. One does get a sense therefore that Heurgon managed, a little like Rocard, to impose himself on the PSU’s memory to a greater extent than the younger man. It is rather telling that Le PSU, des idées pour un socialisme au XXIe siècle?, the 2012 book of a 2011 conference held at the Heurgon family seat in Cerisy, features not only two separate pieces on Heurgon, but 17 index references to him and none at all to Sauvageot, even though the book was edited by …. one Jacques Sauvageot. Although Sauvageot contributed a brief introduction to the publication, much of it is devoted to introducing the ideas of others, rather than imposing his own, and the texts of the (very male-dominated) debates that follow read like a Who’s Who of many of the well-known figures of the PSU, with one exception, namely himself, suggesting he certainly did not abuse the chair’s privilege at that conference. Even his academic publications on art and architecture appear mainly to be essentially editing and prefacing the works of other people. There is a relatively simple explanation for this: Sauvageot’s mode of operating was fundamentally a collective one – and therefore arguably one true to the spirit of ’68. In his report to the congress of December 1968, Sauvageot argued that the key role of UNEF in May was as a catalyst and a political unifier. As even Alain Krivine, a political rival then, has acknowledged, ‘Jacques incarnait une sorte de consensus, de socle commun entre des groupes très différents voire totalement hostiles les uns aux autres!’. His interlocutors were politically broad: according to Claude Pennetier’s entry on Sauvageot for the Maitron dictionary of labour biography they included among trade union leaders not only Eugène Descamps and André Jeanson of the CFDT, but rather more surprisingly, Georges Séguy and Henri Krasucki of the CGT. Indeed some less often reproduced photos from 13 May show both Descamps and Séguy further along in the same chain of linked arms as the three student leaders (presumably the middle-aged union bureaucrats were deemed less photogenic). Yet in the above photo of Geismar, Sauvageot and Cohn-Bendit, as in the majority of surviving images of the trio together, whether at press conferences or on demonstrations, it was not Cohn-Bendit but Sauvageot who was positioned centre. Here, then, was someone who could bring people together. And in the period after 1968, Sauvageot really walked the walk as well as talked the talk. After doing military service in Corsica he devoted several years to unpaid rank-and-file activism in the PSU and then more obscure splinter groups, while earning a living as an agricultural surveyor and as a semi-skilled worker in an electrical factory. He also founded a pirate radio station in Saint-Nazaire, which he would later describe as ‘la conséquence de cette volonté que nous avions alors de créer d’autres rapports avec les gens, d’expérimenter de nouvelles façons de vivre, de voir et de raconter.’ Around this time Sauvageot returned to the university world as an art historian at the Ecole des Beaux-Arts in Nantes, before directing the Ecole régional des Beaux-Arts de Rennes for twenty years after 1989. Higher education management might seem an incongruous, if hardly unparalleled, career end point for a Sixties radical who believed in workers’ control, although the location reminds us of the crucial role of art colleges in the broader culture of ‘68. But an indication of where Sauvageot’s heart truly lay was the way in retirement he established in Paris the Institut Tribune Socialiste, a kind of lieu de mémoire for everything that the PSU did and stood for. But the Institut is not merely the equivalent of a club for old soldiers to meet and reminisce about the past, or a band reforming to play their fans the same old hits. Thanks to the efforts of Sauvageot and his comrades, it regularly organises debates and publications on issues of current concern from women’s precarity in employment to the crisis of democracy, which demonstrate how the PSU’s concern to debate what socialism would mean in modern society is more relevant today than ever. In his introduction to Le PSU, des idées pour un socialisme au XXIe siècle?, Sauvageot argued in defence of a 2010 event in Issy-les-Moulineaux to mark the 50th anniversary of the founding of the PSU that: ‘Se retrouver à l’occasion de cet anniversaire ce n’est pas céder à la mode des commemorations: c’est une histoire de vie. Elle n’est pas morte avec <<l’organisation PSU>>. Peut-être pourrons-nous lui retrouver du sens pour la vie d’aujourd’hui. L’affiche éditée à cette occasion proclamait <<50 ans plus tard … le réalisme c’est toujours l’utopie>>’. I was there that day in Issy – and still have the entrance ticket bearing this slogan above my desk. So in May 2013, on hearing of the establishment of the Institut Tribune Socialiste, I completed the questionnaire to be put on their mailing list, enclosing my previous publications on the PSU, and mentioning that I was now researching post-1968 social movements against the dominance of the car in the city. I thought nothing more of the ITS until, in October the same year I was astonished to receive an email in my inbox from the ITS’s director, one Jacques Sauvageot. What is more, the email opened with a long and profuse series of apologies for the delay in replying to me, before going out of his way to make numerous very helpful suggestions for leads in my research. The effect on me was rather as if a historian of the French Revolution had somehow received an email from Danton expressing his most fulsome apologies for the inconvenience and a hope that the recipient would not hold it against him, before offering a copy of the minutes of the Committee of Public Safety from the Year I. So I rushed to make an appointment later that month to use some papers at the Institut Tribune Socialiste that had recently been donated by Louis Jouve, a PSU member active on urban issues. Entering a typical old-Parisian run-down courtyard in a side street not far from the Place de la République, after ringing the bell it was necessary to climb several flights of stairs past the headquarters of various other activist endeavours before being cheerfully greeted by Sauvageot himself in person. While the papers I had come to see were certainly very useful, my chief memory of that October day is spending much of it chatting to Sauvageot. For this was no ordinary archivist, but a central actor of the historical period I was researching, so now was a golden opportunity to ask questions. Not the obvious ones about May ’68, but a more free-flowing dialogue about the place of transport in society. I was able to clarify the origins of the PSU’s role in the demand for free public transport: it appeared in the party’s 1971 local election manifesto, and grew out of a wider call for gratuité that, Sauvageot felt, was important for the party: they also demanded free childcare, and gratuité had already been implemented for swimming pools in the summer. On seeing I was reading an article from La Tribune Socialiste about cadre de vie, Sauvageot explained that this was what later became cadre de vie et environnement and, later still, écologie, but with the difference that cadre de vie was seen as one aspect of capitalist exploitation amongst others, rather than as an end in itself encompassing everything. But these issues were important – something about which a lot of people mobilised: ‘c’est un peu l’ancêtre d’un aspect que le mouvement écologiste répresente’. Indeed, Sauvageot considered, not everything starts in ’68 (a perennial hazard for historians of ’68): as early as 1963-1964, he claimed, La Tribune Socialiste was already publishing anti-car texts. At the time, he added, we did not consider Les trente glorieuses as glorious – that was a subsequent invention of economists. So, plenty of food for thought already, even before I had really begun the day’s formal archival research. Later that morning, our conversation resumed. Sauvageot re-emphasised the ‘nothing new’ theme: he agreed with Marx that capitalism has always been in crisis, but felt that in the 60s ‘we’ had underestimated the capacity of capitalism to resolve its own crises. Today, he suggested, we talk about democratic participation precisely because we don’t have it, because power is so diffused internationally and by finance. The commons is creating links because previously existing links have exploded. For example, Sauvageot expressed criticism of the way that car-sharing has become a market – he had just very recently seen adverts in the metro for a commercial car-sharing service, seeking to make private profit out of something that has always existed – which exemplifies the capacity of the market to absorb everything. It is also extraordinary, Sauvageot felt, that the SNCF is developing long distance bus services on routes such as Paris-Lille or Paris-Nantes to compete with new private sector buses, low-cost airlines and the private car. Here, then, was an old-fashioned French anti-capitalist of 1968 vintage time-transported to the France of BlaBlaCar, OUIBUS and what would soon become les cars Macron. On arrival at his destination the time-traveller was clearly puzzled by aspects of capitalist modernity that we might be tempted to take for granted: this sense of puzzlement rather wonderfully expressed the difference between the world of ’68 and the world of today. Perhaps typically for his generation of activists, although always a principled internationalist (he spent the Easter vacation of 1968, for example, at an anti-imperialist conference in Italy), Sauvageot could appear naïve about the world outside France. On a subsequent occasion in 2015 I was present at the ITS for a discussion on immigration at a time when Sauvageot was preparing a journey to speak at a conference at Portsmouth University, where a number of UK-based historians of the Sixties would not only hear Sauvageot and other veteran activists address them, but also share a memorably convivial barbeque with him at a Southsea hall of residence not far from the Isle of Wight hovercraft terminal. And at the ITS, Sauvageot told me that he would like some advice for his trip: would he need to change currency, or did Britain use the euro? But back in October 2013, the day’s archival researches concluded, the moment of truth arrived as I broached the elephant in the room: how, I asked Sauvageot, did the PSU travel themselves? Most activists, he responded, especially those living in the banlieue, took public transport, naming one individual who still does not own a car. I had read in other sources, though, that Marc Heurgon travelled everywhere by car. But then, as Sauvageot explained to me, Heurgon lived in the 16th arrondissement and possessed a belle proprieté familiale, so his driving habit was not out of character. As for Sauvageot – himself the son of an SNCF employee – it was so long ago that he last drove in Paris that he had forgotten how to do so: when living in Massy, he took the RER and metro a lot. Nevertheless, he thought that some members of the PSU’s Bureau national must have driven, for their meetings, held near the Porte d’Orléans, tended to finish very late at night after the last metro had departed. Today he observed, no-one comes to meetings at the Institut Tribune Socialiste by car except one person who has difficulty walking: everyone else arrives by metro because there is nowhere to park – whereas in the Seventies some people did arrive by car because you could park then. Indeed in 1967-1968 Sauvageot himself travelled by car from where he was living in Antony to UNEF meetings in Paris, because he did not have other meetings in Paris, and the UNEF meetings finished late. Indeed, on one May ’68 demonstration, revealed Sauvageot, his own car was almost overturned. I asked whether PSU people refused to drive out of a political preference for public transport, and the answer was negative – it was later écolos who made transport choices on ideological grounds, whereas at the time PSU activists’ choices were for practical reasons: oil was cheap and parking was free (he never had to leave a meeting to feed a parking meter). That driving is more expensive today, he argued, is more important an influence than ideology on the fact that the same people today travel largely by public transport – so either their Seventies movement was successful in that public transport in the Paris region has become relatively cheaper than it was, or economic reasons are paramount. Sauvageot noted that there has been a shift from the practical to the ideological in discourse on transport, the environment and agriculture, and that the reality is people, especially in France, will drive if they can, citing the way that pedestrianised streets are filled with cars on Saturday nights because the police are absent. One conclusion that might be drawn from Sauvageot’s reminiscences about the transport habits of PSU activists that they illustrate how important getting public transport and parking policies right is in bringing about modal shift. Moral exhortation is not enough: even anti-capitalists need some gentle incentivisation to affect their transport behaviour. The more fundamental point, though, is that they illustrate how ultimately Sauvageot, who until that day had to me been a rather mythical figure, did live in the same world as the rest of us. It is a cruelly tragic irony of fate that, four autumns later, Sauvageot died as a result of a road traffic accident in which, coming out of the Institut Tribune Socialiste, he was run over by a scooter. That makes him one of around 270,000 pedestrians who will be killed around the world this year. It is too late now, but I would like to express my thanks to Jacques Sauvageot for the memorable day we shared together. Sauvageot may have been a big name, but he had the generosity of spirit of the best kind of rank-and-file activist. The final thing I wrote down in my notes from that meeting, although I cannot recall precisely to what he was referring in particular, seems a rather pertinent epitaph, pertinently critiquing the spirit of our age: ‘La présentation prend plus d’importance que la réalité’. May Jacques rest in peace, and the memory of his histoire de vie, of his struggles for a better world, live on.